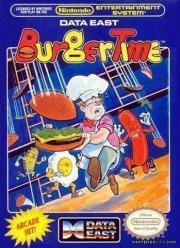 BurgerTime is a 1982 arcade game created by Data East initially for its DECO Cassette System. The player is chef Peter Pepper, who must walk over hamburger ingredients located across a maze of platforms while avoiding pursuing characters. In the United States, Data East USA licensed BurgerTime for distribution by Bally Midway as a standard dedicated arcade game. Data East also released its own version of BurgerTime in the United States through its DECO Cassette System.